This new Southwest credit card joins an ever-growing lineup of rewards credit cards with giant signup bonuses. This new addition to the Chase family offers 2 free roundtrip flights with your first purchase, plus 6,000 Rapid Rewards points on every anniversary of your card membership ($100 in Wanna Get Away fare). 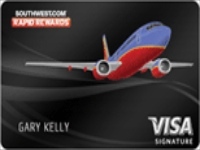 Unlike most rewards cards, the Southwest doesn’t require you to spend, say, $5,000 in 3 months to get the bonus. It’s given right after your first purchase. Even more, get 2 free flights after using your card for the first time. Act fast, this offer is for limited time only. Points can be used for International Flights, Hotel Rooms, Gift Cards and many more. Luggage fees do NOT apply – so your bags fly for free! Leave a comment on Two Free Roundtrip Ticket Signup Bonus!